Both of my parents drink their coffee hot and black. Thus, in my world, REAL coffee drinkers drink it black. I don’t like black coffee – so I didn’t drink it. Well, except for an occasional ‘cheat” when I accepted a doctored-up version because coffee was what a host was serving or when inexplicably drawn to it while eating a rich dessert. 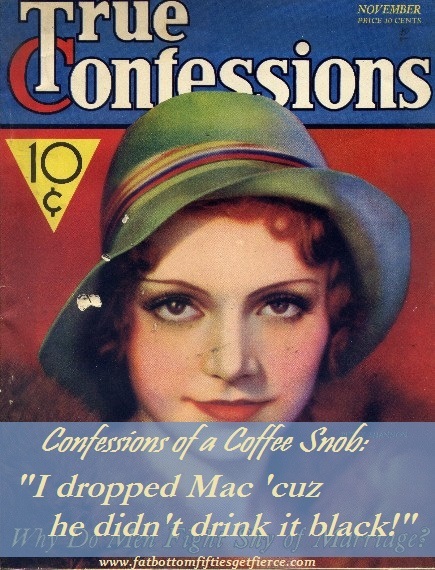 I would hear others go on about how they love coffee – and I’d mentally judge them harshly as they adulterated the REAL deal with sugar, syrups, powders and dollops of cream. Clearly they didn’t actually like coffee. Over the past year I kept encountering articles touting the benefit of coffee when it comes to staving off alzheimers. * By the fourth article I wrestled with refusing to drink coffee if I couldn’t drink it the right way versus potentially increasing my odds against developing such a debilitating disease. Dealing with a beloved family member who is in the early stages of alzheimers, I decided the potential benefit outweighed my pride with regard to being perceived as a weenie so-called coffee drinker. What?! After 50 years I find that my parents actually at one time were weenie-coffee drinkers, too? Or does it mean that one’s NOT a woose because they add a little flavor to their joe? I felt like the lady who cut her roast in half and cooked it in two pans for years as her mother did when she was growing up – only to learn decades later her mother did that because she didn’t have a pan big enough for a roast.